*Post brought to you by Grand Sasquatch Books. Tomorrow is the last day of school for the Fujilings. I can’t quite believe that we are already finishing this school year! Both of them are in an immersion Chinese program where they spend half of their day speaking and learning in English and half of their day speaking and learning in Chinese (with all native speakers as instructors). This was Squirrel’s 5th year of Chinese and Bug’s 3rd year. This is what homework looks like these days . . .
Little did I know when we visited China with Squirrel when she was 6 months old that she would be learning the language someday! Needless to say, the Chinese language and Chinese culture has had a growing presence in our family. So when I was contacted about a new Chinese cookbook that had been published that made cooking Chinese comfort food at home more approachable, I knew I had to take a look! Chinese Soul Food, A Friendly Guide for Homemade Dumplings, Stir-Fries, Soups, and More by Hsiao-Ching Chou was published earlier this year. Hsiao-Ching Chou is an award-winning journalist and cooking instructor. Her family moved from China to the US when she was a young child and eventually opened a Chinese restaurant. 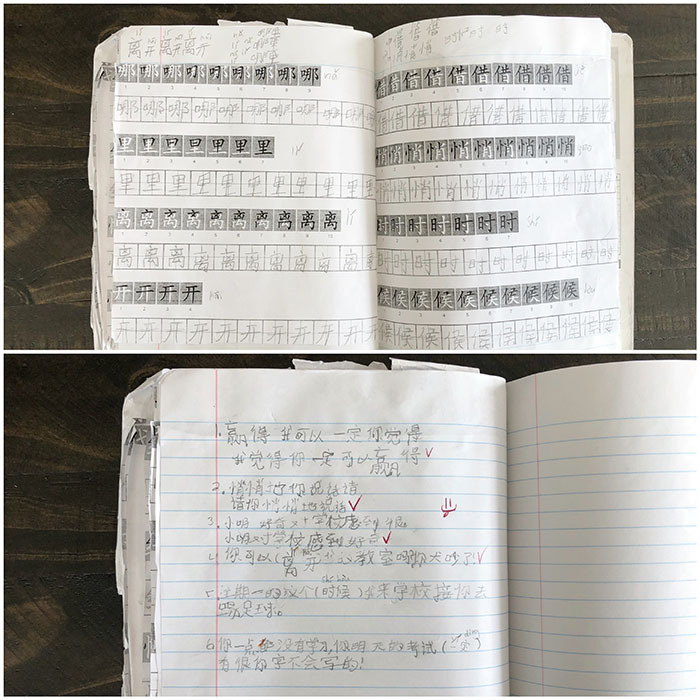 Her memories of growing up are filled with images of her mother making dumplings, of “eating bowls of rice topped with red-braised pork”, and of the sound of wooden chopsticks tapping the bottom of a cook pot. Hsiao-Ching became a professional food writer and in 2015 began teaching regular classes on Chinese cooking at a cooking school in Seattle. Her goal in writing Chinese Soul Food is to get people into the kitchen and show them that cooking Chinese food in a Western kitchen isn’t as hard as it may seem. The book starts with a chapter on key ingredients, techniques, and equipment that she uses in the book and are common in Chinese cooking. The chapter includes information on different cutting techniques, including pictures that show you what ingredients look like after being cut in a certain way so that you don’t have to try and picture it just based on the description. If you have any dumpling addicts in your house like we do (Bug could live on them), there is an entire chapter devoted to them, starting with how to make dumpling wrappers from scratch, how to fold them, store them, and of course recipes for what to fill them with! There are chapters covering “little eats” (things like egg rolls and sesame flatbread), rice and noodles, stir-fries, soups and braises, celebration (recipes for celebrating Chinese New Year), and guilty pleasures (recipes that aren’t necessarily authentic, but are favorites nonethless, like General Tso’s chicken). The book is a wonderful mix of recipes (that work!) and Hsiao-Ching’s memories. We have loved cooking from the book and reading about the origins of the different recipes. Everything we have tried has been delicious. If you are plant-based, like our family, the recipes can easily be adapted. 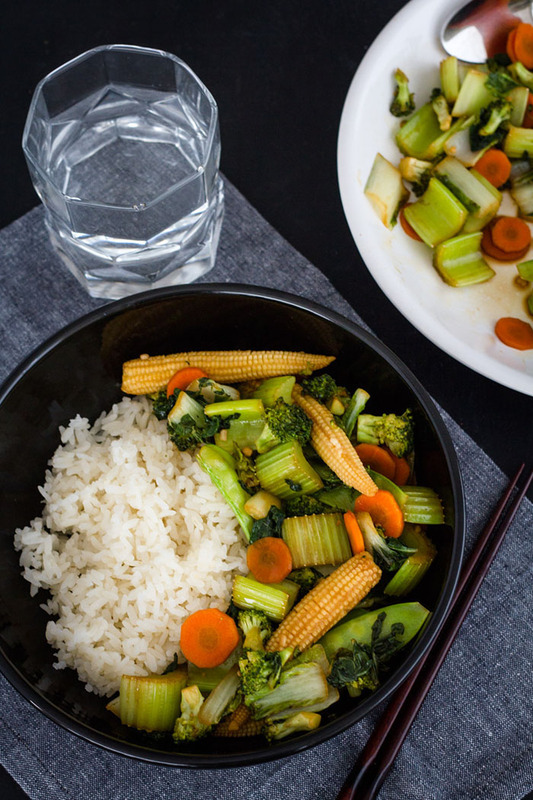 Many Chinese dishes, like stir-fries, are as Hsiao-Ching describes, “vegetable-centric with meat only as a condiment.” You can substitute things like tofu or jackfruit for the protein and use other vegetarian substitutes for things like oyster sauce. 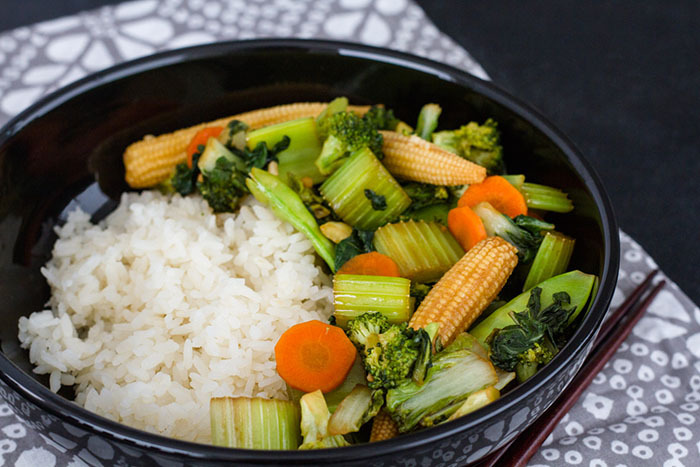 One of the dishes we have cooked several times is “Vegetarian’s Delight.” Hsiao-Ching writes, “You often see incarnations of stir-fried mixed vegetables in Asian restaurants. 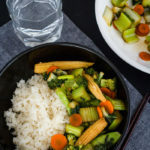 My father coined ‘vegetarian’s delight’ to describe our version.” It’s a simple stir-fry that is perfect for using up the vegetables sitting in your refrigerator or pantry, or to cook with whatever you pick up at the farmer’s market. One of the reasons that we have made it several times already, besides the fact that it’s delicious, is that it’s quick. Once you chop all of your vegetables and assemble the other ingredients (which amounts to 4), the stir-fry comes together in well under 10 minutes! 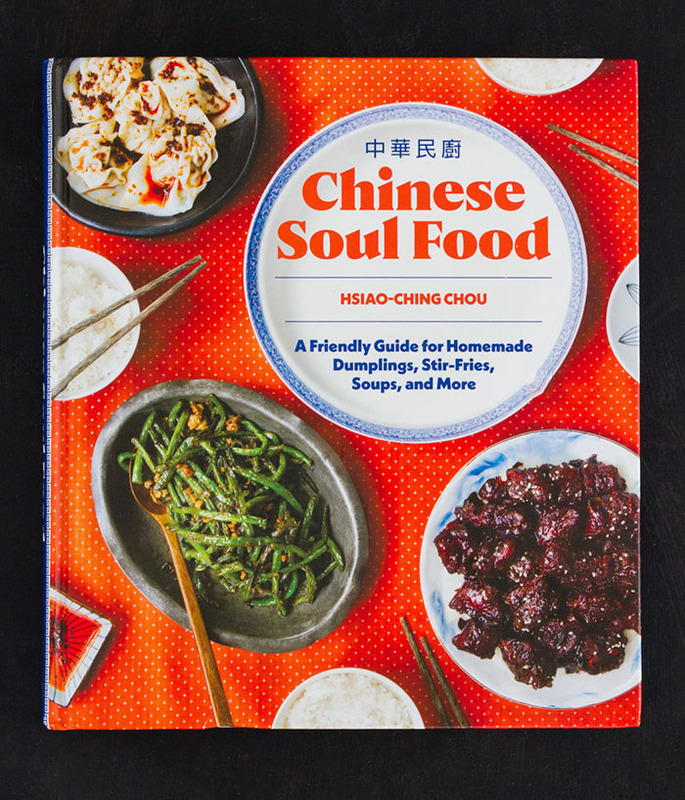 If you love Chinese food, like we do, and want to start incorporating some Chinese dishes into your cooking routine, then order a copy of Chinese Soul Food! Reprinted with permission from Chinese Soul Food by Hsiao-Ching Chou. Published by Sasquatch Books. This is a quick and simple stir-fry recipe from Hsiao-Ching Chou's family Chinese restaurant. 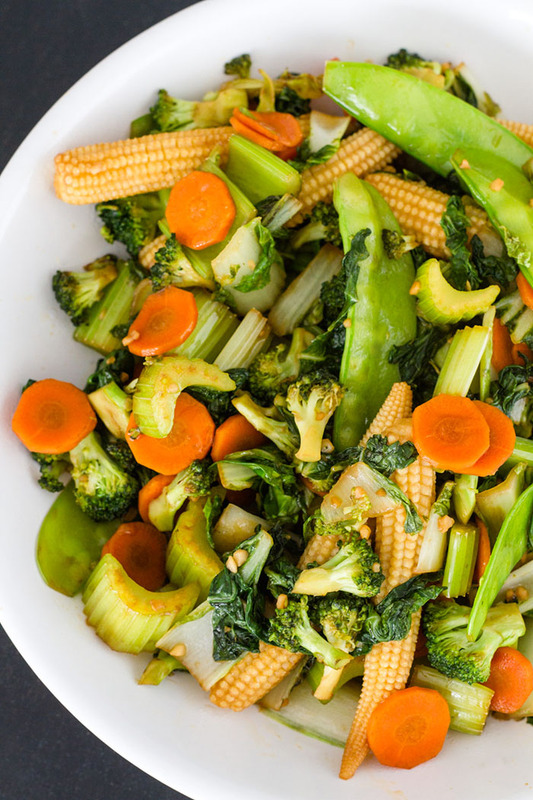 Once you have chopped all of your vegetables the stir-fry comes together quickly, well under 10 minutes! You can use your favorite vegetables making it a great way to use up vegetables in the fridge or celebrate whatever is in season. Preheat a wok over high heat until wisps of smoke rise from the surface. Add the oil and heat until it starts to shimmer. Add the greens, and toss and stir to wilt them. Add the peas, carrots, and corn. Stir-fry for 1 to 2 minutes more. Add the water, garlic, and soy sauce. Stir and toss to combine, continuing to stir-fry until the greens have wilted and don't look raw, about 1 to 2 minutes. The timing can vary slightly depending on the type of vegetable you're using. Drizzle on the sesame oil. Serve with rice. *Disclosure: Sasquatch Books publishing company sent me a review copy of the Chinese Soul Food cookbook at no cost to me. All experiences and opinions are my own. Love this vegan dish, looks very easy to make. kids will not eat it, but this will do great from my diet, hope husband does not order a pizza. LOL! Fingers crossed for your sake!